"Highly metastatic cells leave their happy home and have all these stresses on them. One way that the cell is able to deal with stresses is through disposing of cellular wastes or damaged cell components and recycling them. When we turn off the activity of cellular structures called lysosomes, which a cell uses to do this recycling, the metastatic cells become unable to survive these stresses," says Michael J. Morgan, Ph.D., assistant research professor at CU Cancer Center and now assistant professor at Northeastern State University in Oklahoma. Morgan worked with bladder cancer expert, Dan Theodorescu, MD, Ph.D., former director of the CU Cancer Center and now director of the Samuel Oschin Comprehensive Cancer Institute at Cedars-Sinai, and Andrew Thorburn, DPhil, CU Cancer Center investigator, professor and chairman of the CU School of Medicine Department of Pharmacology. Thorburn and Morgan specialize in the study a process called autophagy, which brings cellular wastes to the lysosome, while Theodorescu is a recognized leader in the study of metastasis. The word autophagy is from the Greek for "self-eating." 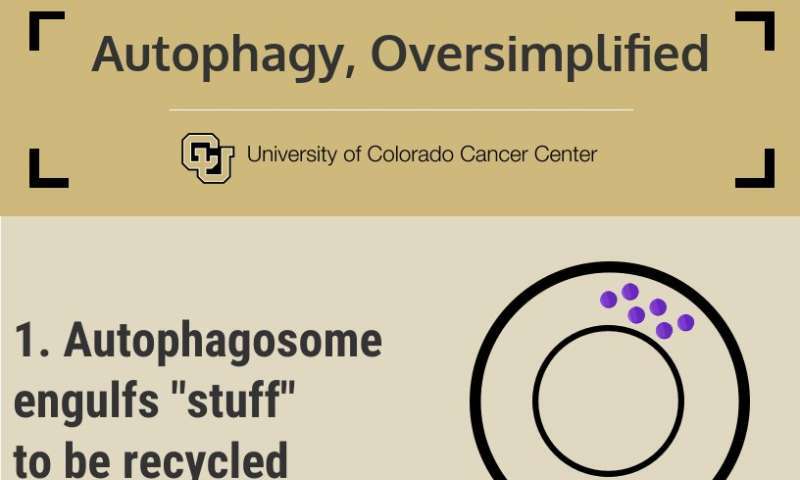 Very basically, in the case of cancer cells, autophagy requires grabbing and then degrading damaged or unneeded structures within the cell to survive situations that would otherwise kill them. First, the thing to be "eaten" is engulfed by a structure called an autophagosome. The autophagosome has two cell walls—an inner and an outer membrane—and between these membranes are dangerous little packets called lysosomes. The lysosomes contain molecules that break things apart. Once inside the autophagosome's outer membrane, lysosomes deliver molecules to break down the thing to be recycled. In fact, ID4 has been known to predict patient outcomes in bladder, prostate and breast cancers—the higher the level of ID4, the better patients tend to do.